The designing and refurbishing of Plas Penglais, University of Wales Aberystwyth. 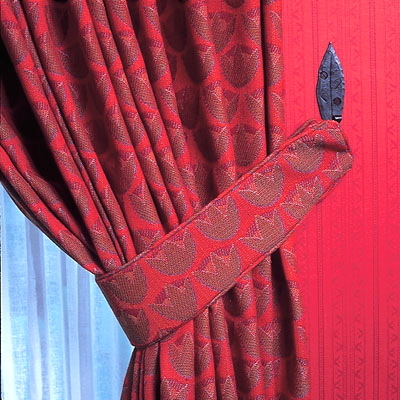 A bespoke range of wool fabrics in striking bold colours for curtains, carpets and soft furnishings designed and woven specially for the interiors, inspired by the slate carvings of Dyffryn Ogwen. The designs were also used for the hand tufted carpets and the custom made iron and copper light fittings, curtain poles and finials and on the unique bed in the guest bed room. The concept of the whole interior was based on the indigenous slate art of Dyffryn Ogwen beautifully carved images of plants, symbols and of life in the valley.